Located in the same parking lot as Rite Aid and across the street from the Mercer Island Post Office. Not an office with staff, only a classroom location for class sessions and pick up/drop off for lessons and tests. Our office with staff is located in Kirkland at 10505 NE 38th Place Bldg 9. Speed up the registration process: pre-apply, the first step to getting your first driver license, instruction permit, or ID card. Provided in our classes: 34 hours of classroom, 5 hours of driving, and 1 hour student observation. A parent information session will be held during the second hour of the fourth classroom session or will be scheduled outside of classroom session (you will receive an email letting you know). We strongly encourage a parent or guardian to observe at least one driving lesson. Minimum course length is 5 weeks and all course requirements must be completed within 4 months. A driving permit is required before the first lesson and an electronic waiver will be reported once contact has been made to our office. Students can get their permit up to 10 days before the start date of class. 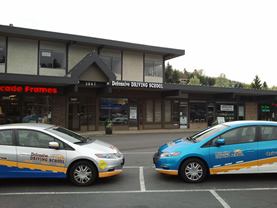 Driving lessons are held outside of classroom meeting times and will extend beyond the end of the classroom portion of the course and typically take place every 1-2 weeks starting the second week of class. Upon completion of the course, an electronic certificate will be reported to the Department of Licensing. This process takes up to 3-4 weeks. Most of our communication is through email. When registering please provide a valid, regularly checked email address for both student and parent. Please keep all summer vacations and traveling in mind when registering for the course. Students must be completed 4 months from the start date of class and are only allowed to miss 3 class sessions. Click on “View More Info” for pricing and additional class information. After clicking the register button if you get a spinning circle please click the refresh button on your browser to see order details. No courses were found at this location. Try your search again. I will attend all scheduled appointments. No shows and late cancellations, as well as not having a valid permit, will be charged as if the lesson took place. I have read and agree to abide by the enrollment terms and conditions of Defensive Driving School. I have read and agree to abide by the terms and conditions of use of Schedule Agent.